There were big wins for Craster/Embleton and Alnmouth United in the North Northumberland League on Saturday, whilst North Sunderland also picked up three points on the road. 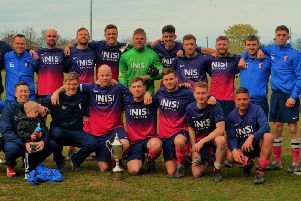 League leaders AFC Newbiggin were without a game, but still remain top of the table with a 100 per cent record of nine wins from their first nine games. Lowick started well but Alnmouth took a 30th minute lead through an Ashley Lalley goal. The lead was doubled two minutes later following an own goal, then on 40 minutes Regan Turnbull added a third for the home side . The second half was fairly even until the 65th minute when Regan Turnbull netted his second of the game and a penalty from Glen Robson on 70 minutes completed the scoring and sealed the win. In an evenly contested game, Amble led at half time thanks to an early goal from Luke Taylor. The second half was again close but a late strike from Paul Muers gave Alnwick a share of the points . Craster/Embleton took the points with a commanding second half performance at home to basement side Bedlington Seniors A. Play was fairly even during the first half with the home side two goals ahead at the break. During the second half Craster / Embleton made the most of their chances to add another six goals before the final whistle. Goalscorers for the home side were Richard Stanwix and Terry Ord with two apiece, Harry Woolhouse, Rhys Hogg, Jack Lane and Dan Brooks. Overall this was a scrappy game but Amble dominated the first half and took an early lead with a goal from Matty Spiers . The same player then netted a second before Brandon Crombie pulled one back for Wooler just before half time. Wooler came more into the game during the second half and missed a good chance to draw level when they failed to convert a 70th minute penalty. But they did draw level after 80 minutes when Crombie netted his second of the match . Ross Adams was on target for the home side in the first half but the visitors netted three times to lead at the break. In the second half Ryan Crocket added a second for Ashington but two further goals from North Sunderland completed the win to maintain their challenge at the top of the Division. Goalscorers for North Sunderland were Ryan Thompson (3), Adam Weightman and Fraser Tait. Table - Newbiggin 9-27, North Sunderland 9-21, Alnmouth United 10-21, Craster/Embleton 11-17, Wooler 9-14, Lowick United 12-14, Alnwick Town Dev 10-13, Amble Masons 11-11, Amble St Cuthbert 10-10, Ashington Town 10-9, Bedlington Seniors A 9-3. Anderson Cup QF (1.30pm KO) - AFC Newbiggin v Alnmouth United; Alnwick Town dev v Amble St Cuthbert; Ashington Town v Craster/Embleton; Lowick v Wooler. League - North Sunderland v Bedlington Seniors A.